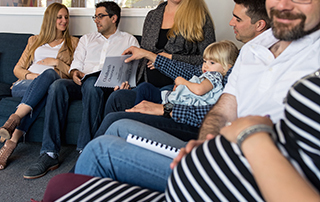 The Family Room’s Before Baby series offers a variety of prenatal classes that give you important information to deliver and bring home your baby with confidence. Our classes are offered in a series, bundled, and `a la carte, to give you the ability to customize your prenatal education for your needs. 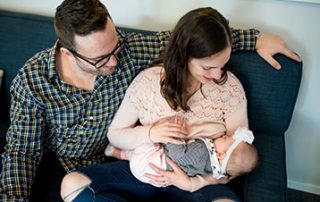 From childbirth classes to breastfeeding information and newborn care, these baby classes are designed to empower parents and help you prepare for your bundle of joy. 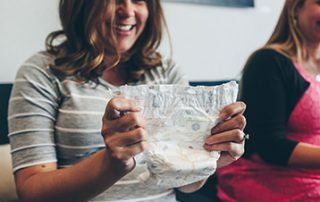 From the physiology and stages of labor and delivery, to basic support techniques and more, a childbirth class is an important way to prepare you and your partner for this life-changing event. This class makes sure you understand the basics. Taken as a stand-alone class or as an extension of the childbirth prep class, this class will teach you a variety of techniques to cope with the discomfort of labor and delivery. No, they don’t come with instructions. This hands-on class will provide practical advice on how to care for your newborn through the first few weeks of exhaustion, hormones, and profound joy! Prepare yourself and caregivers for the unthinkable. 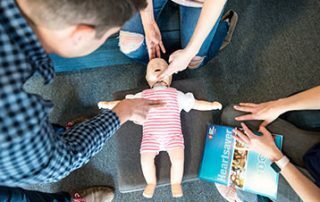 Learn life-saving skills in our Infant/Child/Adult CPR and First Aid class. Note: following American Heart Association guidelines. All courses bundled into one! 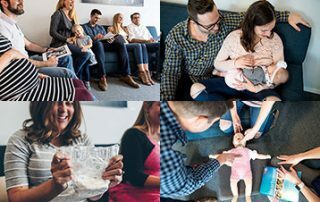 The 4 most important classes to prepare for your baby’s arrival, bundled for extra savings: Childbirth Prep, Newborn Care, Breastfeeding Basics and CPR & First Aid. The Family Room’s Mommy & Me and Parent & Me program is up-to-date with helpful and practical information for today’s parents. We cover newborn and baby development, parenting topics, and more. We always leave lots of time for questions. Our class is also about you – we don’t leave out the parent part of parent & me. Lastly, we always have fun. The group will become your village. You see the same moms every week. You share, bond, grow, connect and go out for coffee or lunch after class. Sometimes, they even become your life long friends. There is a facilitated topic each week that is relevant to the age of the babies’ birth months to nurture attachment and learning with awesome handouts and lots of time for questions. The group is led by a marriage and family therapist with an extensive background in infant and child development. It’s the best of both worlds. The groups are organized by birth month, with generally a two month span, so all the babies are about the same age. We understand that there are many different approaches, philosophies, and ways to do things when it comes to parenting. We will provide research-based curriculum, but want you to trust your gut. The series are 8-weeks long and each class is 90 minutes. The fee for a series is $320. We have developed lots of great topics, but are flexible to meet the needs of each group. Our interactive classes include songs, open discussion and the topic of the week. Don’t see your birth month? Email us with your birth month and we will be sure to contact you when your class is posted. Session you want to join already started? Yes, you can join late! Email us for more information and we will do our best to get you in. The series is 7 weeks due to Easter. The cost has been adjusted. There is not currently a class. In the blink of an eye, your baby becomes a toddler. These years are full of important social, cognitive, and emotional development. It also brings on a new set of expectations, possibilities, and challenges. 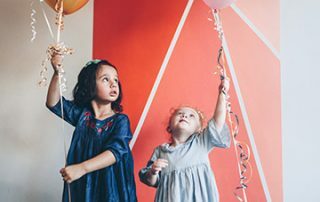 In this new chapter, we want to continue to support you with workshops and classes that will guide you through this newfound independence, help alleviate some of your stresses and support optimal development for your growing child. We expanded our Mommy & Me program to include the next phase: a Toddler & Me series. The Toddler & Me series focuses on the emerging personalities and behaviors of your little tot. In addition to facilitated topics each week, classes also include songs, child-led play and story time. The twos bring with them a reputation for let’s be honest, being terrible, but it doesn’t have to be that way! 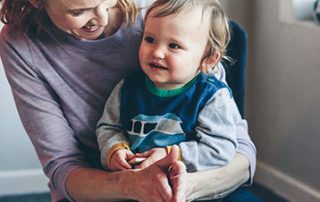 Gaining an understanding of your two-year-old’s behavior from a child development expert, with hands-on learning for you and your little one can help make this time less frustrating for everyone. The cherry on top: there are fun activities for the kids, too! This one is just for you! Our Toddler Parenting Workshop Series covers a variety of topics to help you gain insight and strategies for navigating toddlerhood. The series is led by a child development expert and leaves plenty of time for questions and real-life scenarios. Learn more about The Family Room’s exclusive music program tailored for different age groups and developmental abilities. and fun activities to learn and have fun with your little one. Don’t let people scare you. With some helpful advice, planning, and a sense of humor, it can be double the fun! And do you really need two of everything? Have a carrier, but not sure how to use it? Outgrown your current carrier and need advice on a new one? Meet with Kristina, our babywearing expert, for a one-on-one consult to get all your questions answered. The many benefits of music in the lives of babies and kids are well-documented. From brain and language development, to social and emotional benefits, music is an important building block. It also has the amazing ability to bring people together and provide joy. 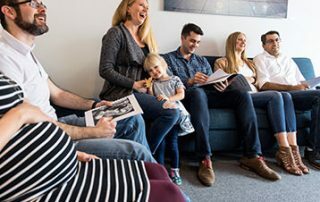 The Music Room, The Family Room’s exclusive music program, is both an engaging and fun way to connect with your child. Music education is tailored to your child’s development and age. The program changes and grows with them. We add more complexity in each stage to continue to build and further develop musicality. We’ve partnered with Encore Music and Performing Arts to develop and lead our music program. We have known Rebecca and her team a long time and are thrilled to welcome them into the family. Our space is a welcoming, family-friendly environment designed specifically for babies and young children. The series are 10 weeks and the classes are 45 minutes long. The cost for a 10-week series is $220. You can purchase and attend a single trial class for $22, as long as the class you are interested in is not sold out. Please check below. A class will be noted as sold out if there is no additional availability. See make-up class policy below. We’ve divided your little ones into the following groups to adapt the program to their developmental needs. Please use as a guide — you know your child best! Prelude (Non-Crawlers): This class gives each caregiver a variety of songs, movements, and melodies to communicate through music and play. Movers & Shakers (about 7-to-14 months): Bounce, sway, and giggle as we engage the senses, explore instruments, and introduce the gathering drum. Single Notes (1-year-olds): Kids and caretakers will have fun while learning musical lessons as the little ones discover their musical world! Rhythm & Twos (2-year-olds): Older toddlers are ready to sing short phrases, put rhythm and pitch together, plus explore movement and dance. 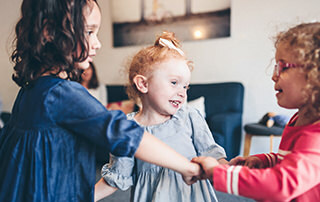 Here Comes Treble (3- and 4-year-olds): Young musicians start to make important musical connections (all while having fun!). To attend 1 trial music class, please purchase below and email us the class you would like to attend. Children learn about the world around them through their senses, in fact they rely on them. The desire to engage with sensory discovery comes naturally to little ones – that is why babies put everything in their mouths! Sensory play is any hands-on activity that gives little ones the opportunity to safely discover and explore using a combination of their senses, including touch, smell, taste, movement, balance, sight and hearing. In our messy play/art classes, they will explore and use their senses in a new, meaningful way. Led by early childhood educators, a variety of sensory activities will be offered each week for the little ones to enjoy — from different tactile experiences, to messy art projects, and creative discovery. Each class also will include songs and a story, plus tips on how to incorporate sensory play at home. The series are 8 weeks. All classes are 45 minutes long. The cost for the 8-week series is $225 (includes a materials fee). We will explore. We will create. And we will definitely get messy.